no mowing, ahhhh, just loafing. Make time for wine! who said something like..."wasted time emjoyed is not wasted time."? sounds fab. 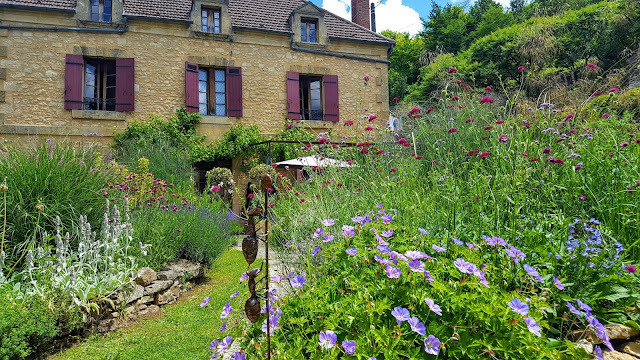 not wasting time by enjoying wine- in France- where do I sign up? I did that just this afternoon and it was marvelous! Sounds like a great plan. With 103 degrees already today, we're staying indoors (or in the pool). This is your wine? If it is I am ready to throw a tantrum that will be heard clean across the Atlantic. There's a lot that can be said for loafing! i guess we garden people are the same the world over. i live in MI, and a friend of mine and i were just talking about this, he's in MA. "july is a planter's month of bliss and rest," he says, and i agree. and i've got some wine right here! to hell with it, it's sunday, and i deserve it! i love this period. sure, there are peas and beans i could be harvesting, but they can hang on the vine a while longer and dry; they are meant to be stored dry anyway. the spring show is all done, the fine summer tall and showy stuff is up and out, and the end of season stuff is just getting ready to go strong. i lament global climate change, but i have to say, here in this 5b, it's extended bloom season for me in a way that i can plant annuals from seed, in the ground, with confidence that they will light up the late summer and early autumn months in such a way as i feel proud of my beds for ~9mo a year. that didn't happen when i was a young girl, and even the best gardeners could normally only count on 6 months of showy bloom. That does sound like a great way to spend the day. Relaxing with a glass of wine, love it! I'm with Catherine. You've worked hard Rob - enjot it. I forgot to mention, the wine featured is the excellent Chateau Terre Vieille which produces wine in the Pecharmant appellation about 25 miles from here. The bottle I bought was a blend of 70% merlot, 20% cabemet sauvignon, 10% cabemet franc and it was superb. Mmm...I will definitely keep that blend in mind while we're in France! We're headed to Europe (England, Germany, Austria & France) on Friday for 2 wks! I like drinking wine while I am working in the evening gardening....this seem fair? Sounds good to me Rob - I obviously need to practice this a bit (a lot) more! You and I grow the exact same plants, so our climates must be similar. I also drink wine, just nothing as good as what you've got here. A glass of wine, a seat in the shade, and a beautiful garden such as yours. Heaven! So, now I have to admit it. I am addicted to checking up on you via your wonderful postings. Luckily (SP?) we are getting some much needed rain so I'm not having to water as much...usually I water the pots once a day. Ahhh, now that's my kind of gardening. It is very hot here and I can do this. sounds like my kinda day in this blistering heat. Now that sounds like a wonderful day! Hope you enjoyed it! 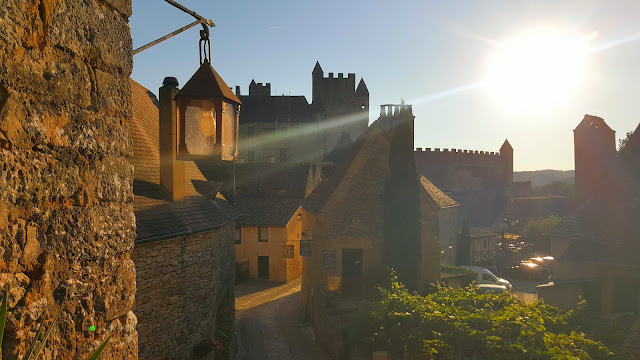 Its been a while since I walked the numerous steps leading up to the chateau at Beynac et Cazenac. Up high, above the balloons with a vista to the Dordogne river below, the view from the castle ramparts is breathtaking yet peaceful at the same time. Its one of those 'pinch' yourself moments and I shouldn't have waited so long to go back. Thundery downpours, hot sunshine and the garden is bursting at the seams. It's one of those years. A month ago we had one of the best blossom displays ever, in turn we'll have a glut of fruit. Everything is growing apace as we approach the longest day. Geranium 'rozanne' and the scabious, Knautia macedonica are particularly turgid reaching easily to a metre in height. I've heard stories of the scabious succumbing to powdery mildew which although there is no chance of that right now, i'll have to see how it performs when things really dry out. Lavender 'hidcote' in pots with the unknown lavender in the garden behind just starting to 'blue' up. It really is the nicest lavender I know (or rather, I don't know) as it flowers a perfect denim blue. A bucolic scene from my terrace. Cows chewing grass which is growing so rapidly you can almost see it gaining in length as each hour passes. Sarlat hosted its annual Goose Festival this weekend. 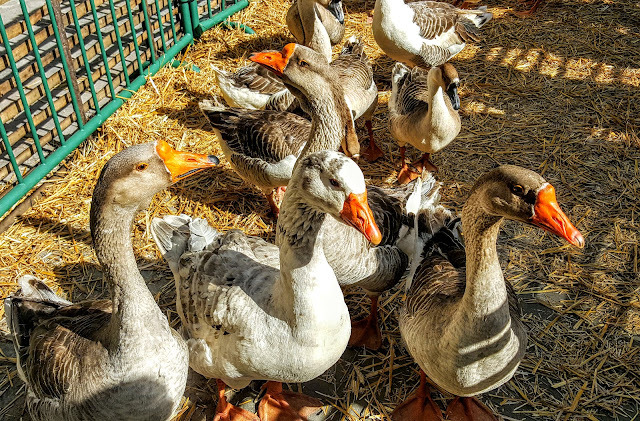 For centuries, both ducks and geese have been a major part in the fabric of rural life in this corner of southwest France and hence are celebrated as such. With the sun shining and the thermometre hovering around 23 degrees, there was no better excuse for alfresco dining - welcome to the 3 hour lunch!